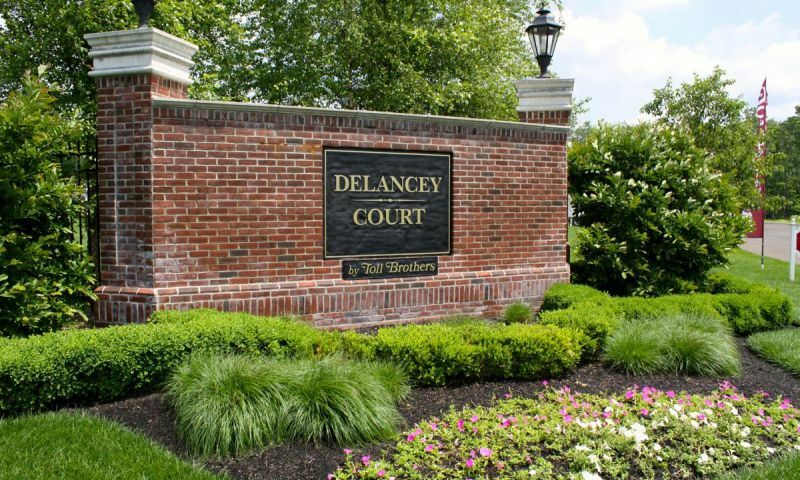 Sheltered from noise and traffic, yet close to everything, Delancey Court in Newtown is an age-restricted community reserved for residents age 55 and better. Started by McGrath Homes in 2008, this elegant community will eventually contain 120 residences. These stately brick carriage houses were designed with maximum luxury in mind. Exterior painting, lawn care and snow removal are included in the monthly homeowner's association fee. This 55 and better community was sculpted after and derived its name from the Society Hill landmark. Residents will enjoy the latest in amenities and modern comforts while basking in the heritage of Newtown in historic Buck County. The stunning Delancey Court clubhouse provides infinite opportunities for leisure and recreation. It is also easy for residents to stay fit and healthy by utilizing the state-of-the-art health and fitness center. The heated indoor pool provides incentive for exercise year-round. Outdoors, combine health and fun by engaging in friendly games on the championship tennis and basketball courts. After, relax by the free-form outdoor pool and soak up the sun on the attached veranda. Social areas include a formal grand ballroom with attached catering kitchens as well as a sports lounge and billiards room. Residents even have use of a library/business center that allows them to meet clients and take care of work-related tasks. Delancey Court is comprised of luxurious carriage homes. These all brick homes are arranged in groups of three or four units. McGrath Homes offers four floor plans: The Hamilton, Jefferson, Madison and Monroe that each offer two-car garages and optional basements. Two of the these timeless home designs have second floor owner suites and include optional elevators. The remaining two models have first floor master suites. Interior features include soaring ceilings, hardwood floors and gas fireplaces. Homes here have great rooms, luxurious bedrooms with well-appointed baths as well as gourmet kitchens with Kitchen Aid appliances and granite counter tops. Some of the homes have private decks, two-story foyers with curved staircases and courtyards backing to mature trees. Delancey Court is a tight-knit, vibrant community where neighbors still know each other. Since Newtown holds a particular place in American history by preserving its early charm, those who live here exhibit civic pride with passion for the future while expressing a respect for the past. Minimum-maintenance homes in this neighborhood make it easy to explore and take pleasure in all that life has to offer. In addition, buyers have the satisfaction of owning quality homes with timeless designs. Within proximity to train stations as well as the the Pennsylvania Turnpike, I-95, the New Jersey bridges and Route One, Delancey Court offers easy access to local destinations and to cities like Washington D.C., New York City, Wilmington, Boston and Baltimore. Bucks County is a haven of rolling farmland, parks and wooded preserves. Nearby New Hope and Peddler's Village are full of quaint shops. Newtown is home to upscale boutiques, charming restaurants and historic sites. Two popular sites are Penns Park, less than three miles away and Washington Crossing, seven miles away.. Delancey Court is also close to scenic river towns. Philadelphia, less than one hour away, with its world-class museums, performing arts, fine restaurants, eclectic galleries and state-of-the art healthcare is a popular destination for day trips. It also functions as a worldly portal via its international airport, less than 45 minutes away. Clubhouse - 5,076 Sq. Ft. There are plenty of activities available in Delancey Court. Here is a sample of some of the clubs, activities and classes offered here. Attached townhomes are available as new construction and resale. They offer between 2,795 and 3,274 square feet of living space. Each home was designed with two to three bedrooms, two or two-and-a-half bathrooms, and an attached two-car garage. Delancey Court is comprised of luxurious carriage homes. These all brick homes are arranged in groups of three or four units. McGrath Homes offered four floor plans that each offer two-car garages and optional basements. Two of the these timeless home designs have second floor owner suites and include optional elevators. The remaining two models have first floor master suites. We were recently out looking at the homes here and the model we saw sells itself! I believe it was the Farnham floor plan. We have friends who live in a Toll Brothers home and they have been very happy with it so we are highly considering this community. It's nice that the homes are still large and elegant yet the community is small and just for our over 55 crowd! I can't give it 5 stars as we don't actually live here yet but it does get a strong 4 stars in my book! 55places.com is not affiliated with the developer(s) or homeowners association of Delancey Court. The information you submit is distributed to a 55places.com Partner Agent, who is a licensed real estate agent. The information regarding Delancey Court has not been verified or approved by the developer or homeowners association. Please verify all information prior to purchasing. 55places.com is not responsible for any errors regarding the information displayed on this website.